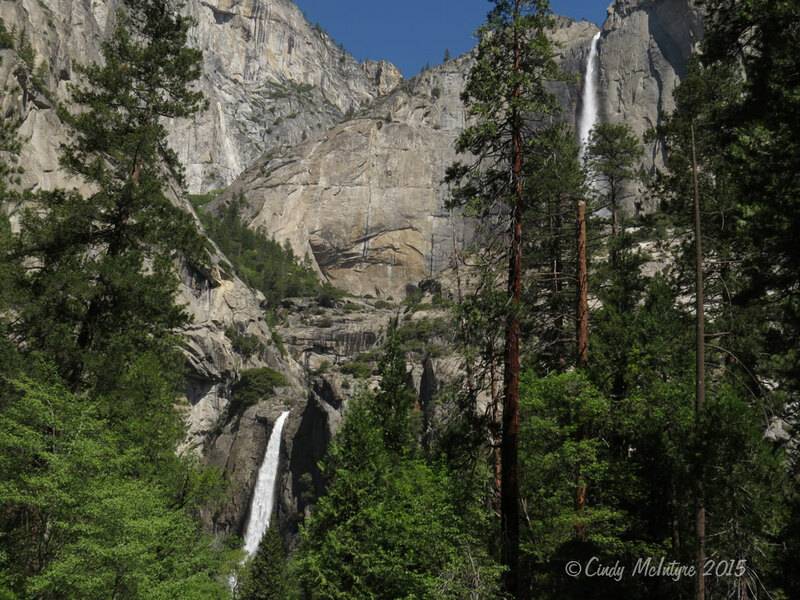 I’m still playing catch-up on editing photographs I took earlier this year, and this series of Yosemite National Park’s waterfalls is from early May. 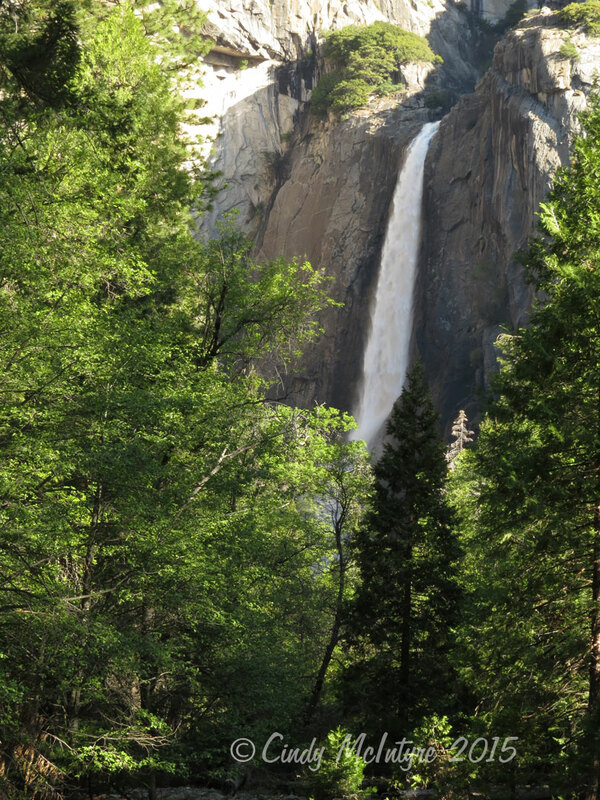 That’s a great time for waterfalls fueled by snowmelt, and before the summer crowds of tourists. 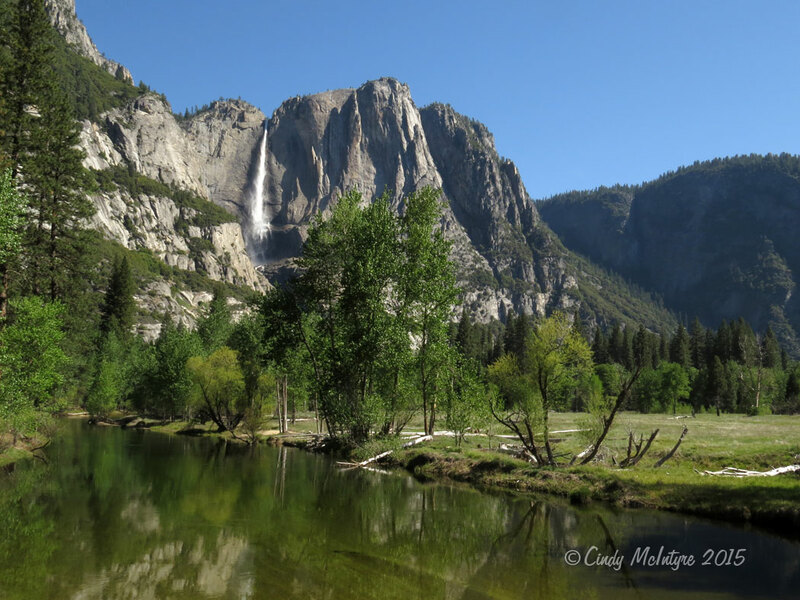 Matter of fact, Yosemite Falls generally dries up in summer, refreshed only by the occasional monsoons. I hoped to see a rainbow in the fine mist at the bottom of the falls I visited, but I guess the sun wasn’t at the right angle. 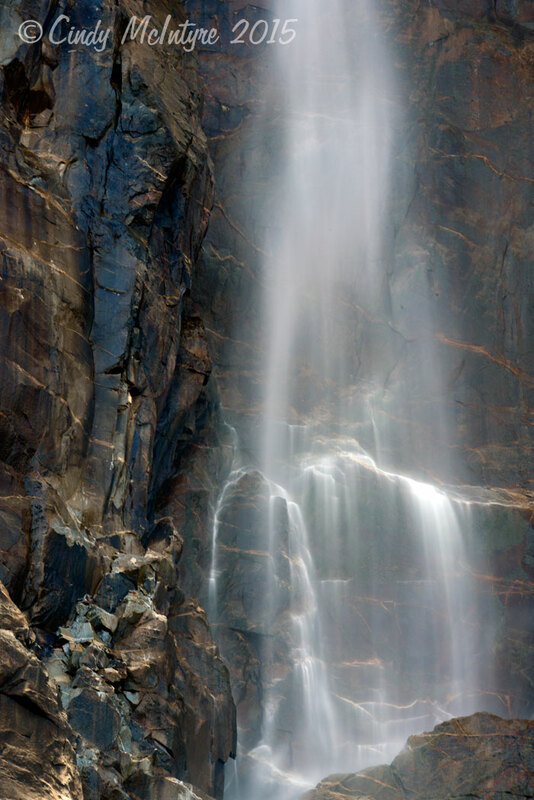 There is also the possibility of seeing a moonbow during the full moon at certain times of year. 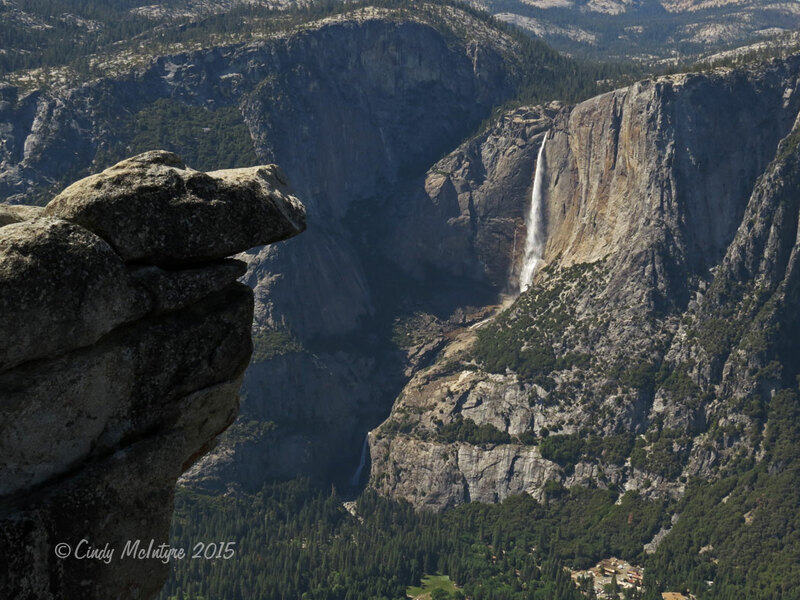 My favorite place in Yosemite is at Glacier Point, with a mountainous vista spread out as far as you can see. I need to see the open sky; being inside a tall forest with only glimpses of the sky is claustrophobic to me. 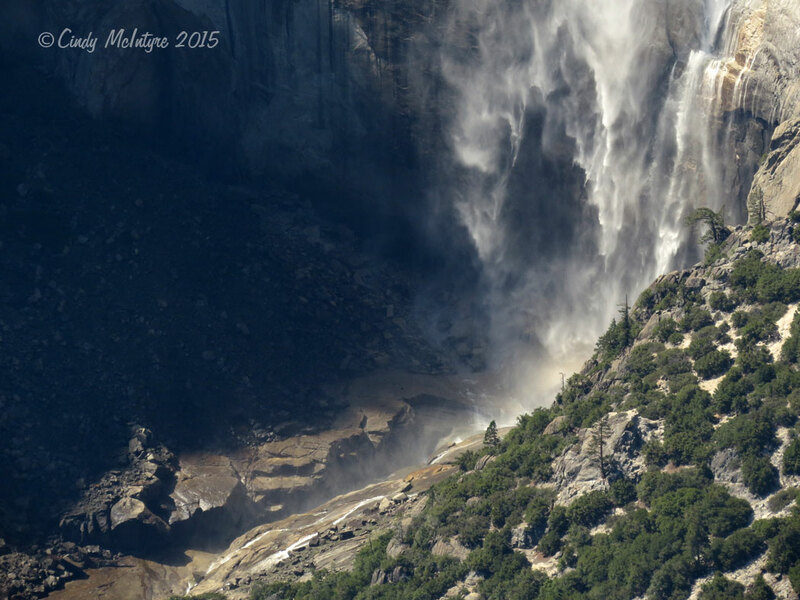 You can also see Nevada and Vernal Falls from there. 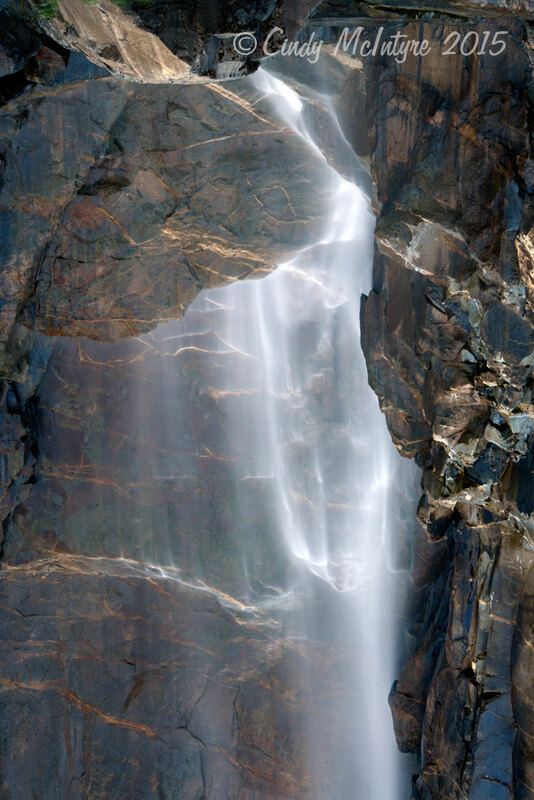 Waterfalls change shape as they descend, bouncing off ledges, hugging rock faces, catching the wind. 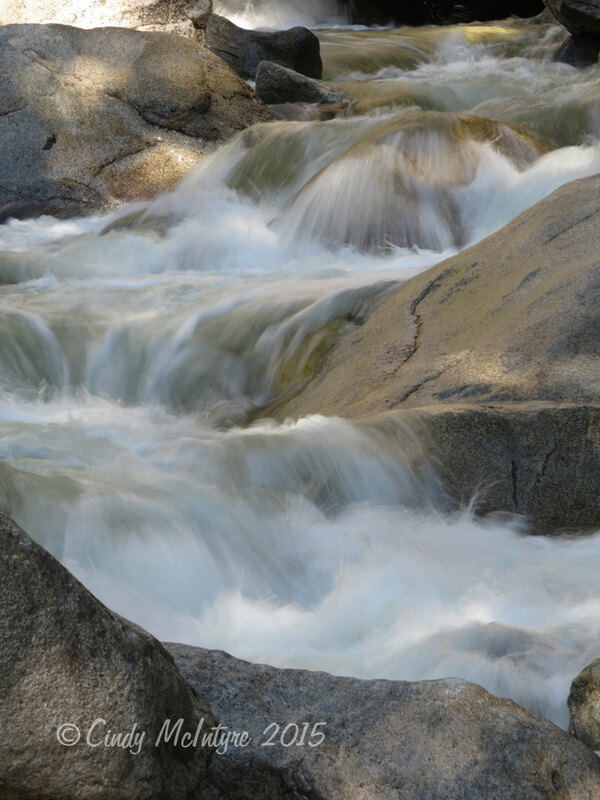 A fast or slow shutter speed on the camera also represents different aspects of water. 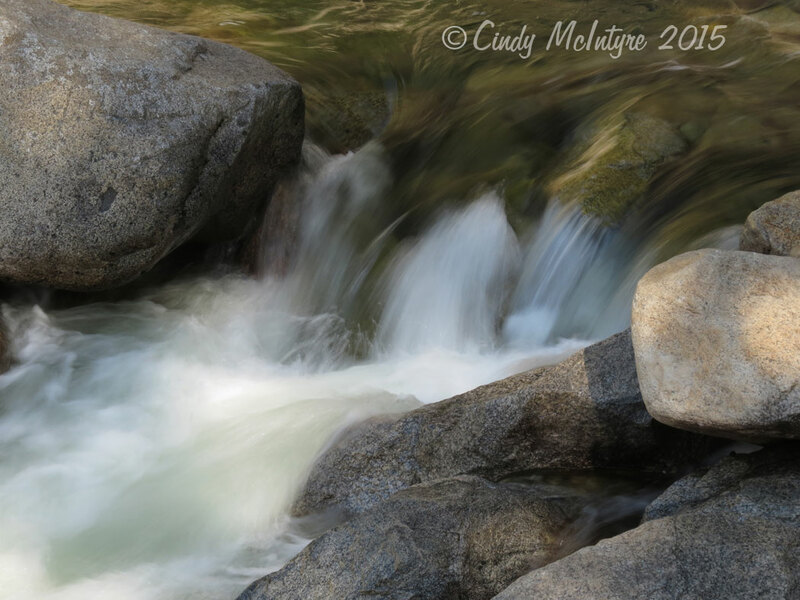 I prefer silky water, so catching the water in the shade and aiming for 1/15 sec or slower is necessary. 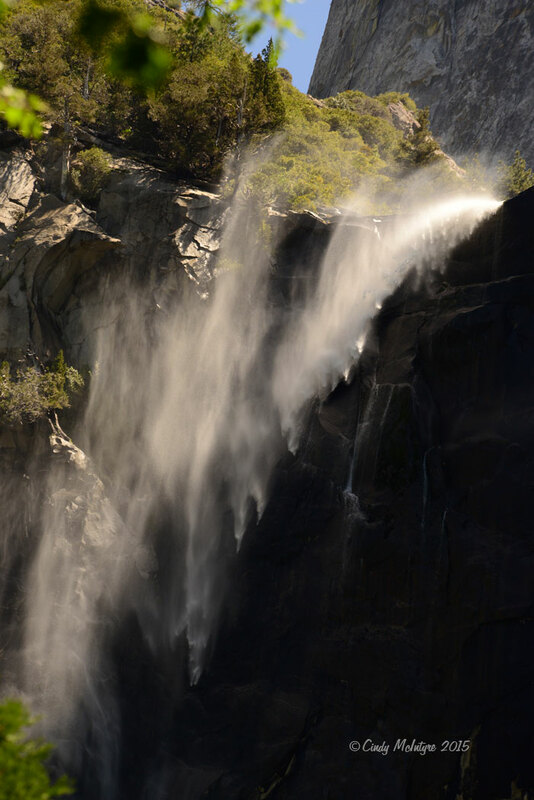 Bridal Veil Falls certainly resembles its name in the bottom photographs. 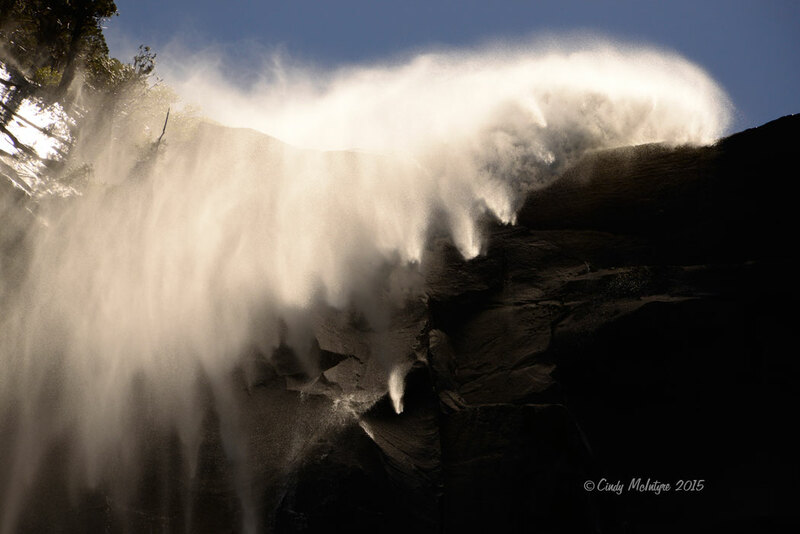 It’s actually a very tall falls, and later that day the wind made it very dramatic. Just a short ways downstream, calm prevailed. 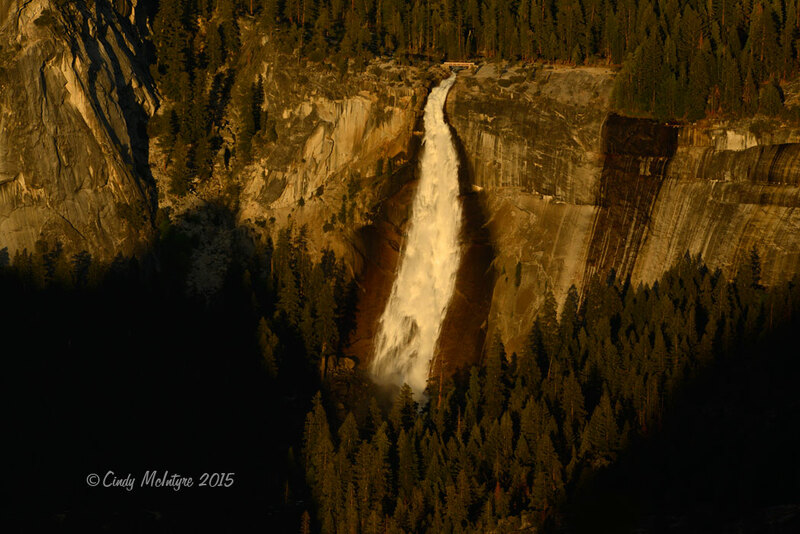 The sunset vistas from Glacier Point are quite spectacular and will be featured in another blog post. 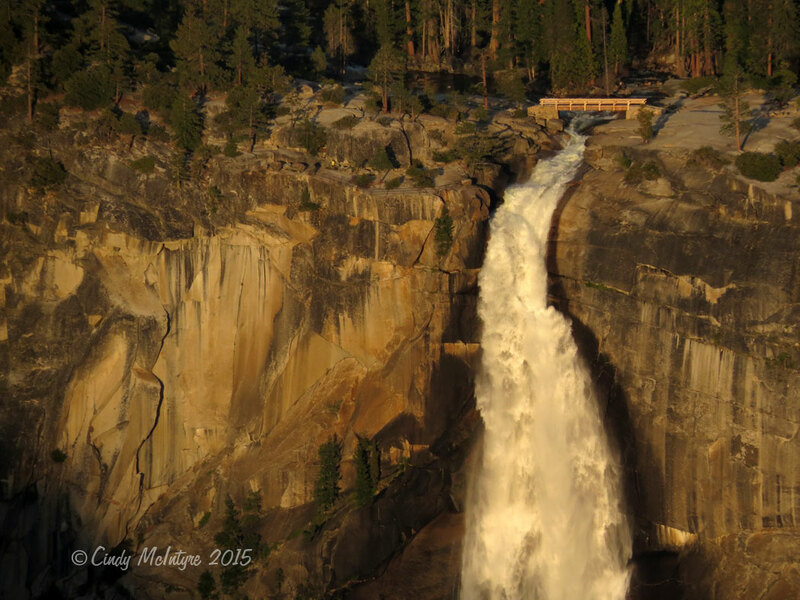 Vernal Falls is about 2,200 feet lower than Glacier Point and caught the sun’s last rays beautifully. With the 1200mm reach of the Canon SX-50, you can even see the footbridge. 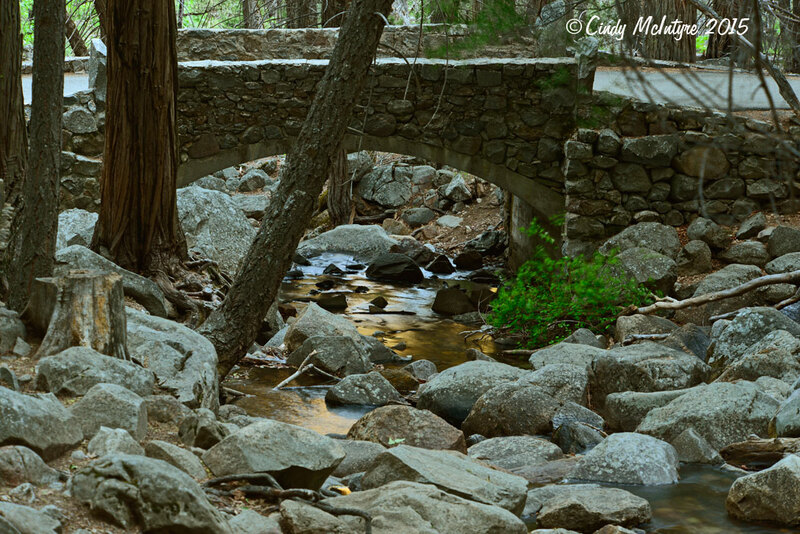 Stay tuned for more from Yosemite!